3Cheers is an affordable, flexible platform that can support any performance-based program. Our model was built to be simple and cost effective, ensuring your recognition spend goes straight to your people. Pretty awesome, right? 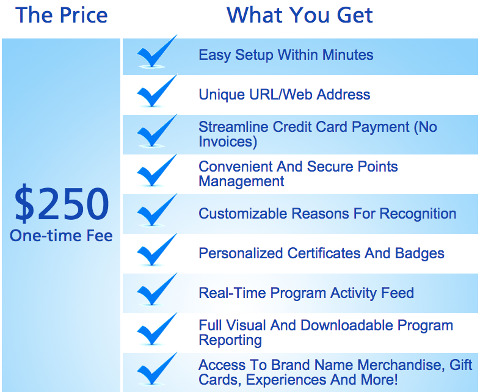 Access to Brand Name Merchandise, Gift Cards, Experiences and More! 3Cheers is a points-based platform and the 3Cheers points are your recognition currency. Each point costs $0.05 to purchase and is worth $0.05 in the catalog when your members redeem for rewards. There are no transaction fees or hidden costs. Points can be purchased at any time, in any amount via secure credit card processing, giving you the freedom and flexibly to set and manage your point budget on your terms and your timeline.